The dome of the Pantheon seen from the hill of Janiculum. The Pantheon (meaning "Temple of all the gods") is a building in Rome. It was originally built as a temple to the gods of Ancient Rome, and rebuilt about 126 AD during Hadrian's reign. Today, it is not known what gods were included. The Pantheon is the best preserved of all Roman buildings. Since it was built, it has always been used. The design of the current building is sometimes credited to Trajan's architect Apollodorus of Damascus, but it may also been Emperor Hadrian's architects who designed it. Scholars now agree that it was not Hadrian himelf who built it. 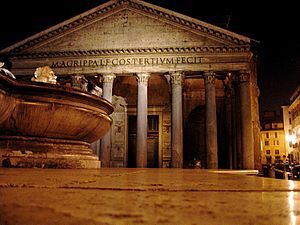 Since the 7th century, the Pantheon has been used as a Roman Catholic church. The Pantheon is the oldest standing domed structure in Rome. The height to the oculus and the diameter of the interior circle are the same, 43.3 metres (142 ft). The Pantheon dome is the largest dome made mainly of unreinforced concrete. It does, however, contain other materials. According to the Jutland Archaeological Society investigations, the lower section of the dome is made of concrete with alternating layers of bricks and tuff; both have good affinity with the lime-pozzolan mortar which filled the voids. The term pantheon is sometimes used for a building where well-known dead people are buried. Pantheon Facts for Kids. Kiddle Encyclopedia.